The Glamorous Life of a Housewife: Super Sweet Shower #3! I've got the best co-workers in all the land. Seriously, not only are they great to work with, but they are super sweet. And who doesn't love sweet people? 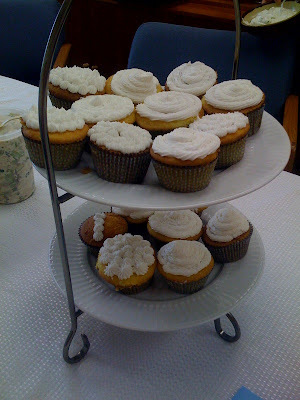 They threw me a "Baby Luncheon" yesterday at work, and I was just so grateful for their thoughtfulness. It was just precious. Lindsey did SO much for the shower, and she did a fabulous job. 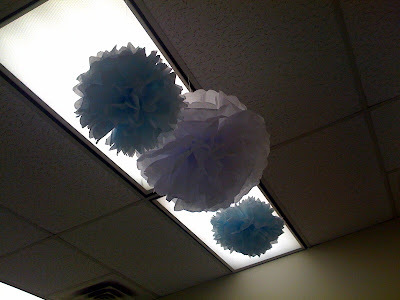 First of all, Lindsey made these super cute things to hang from the ceiling. They were just adorable. I swear she is Martha Stewart. And brought these plates that I had a FIT over. My goodness, they are precious. 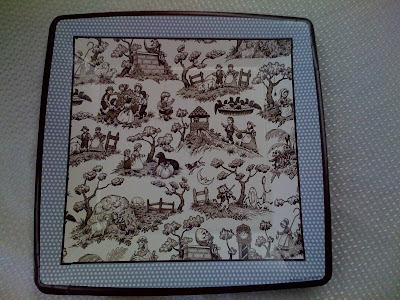 It's nursery rhyme toile!! Could it BE any cuter? Be still my heart. Oh, and there were napkins to match. 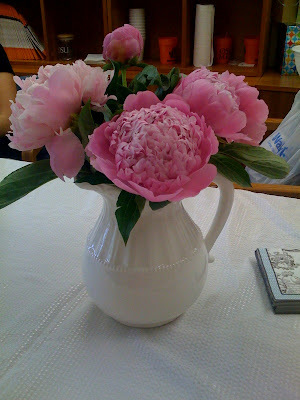 Another lady in my office brought these beautiful peonies! They smelled just as heavenly as they looked. 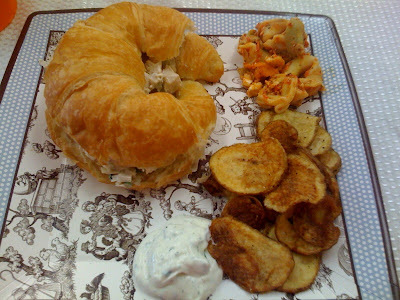 And of course, let's not forget the food! 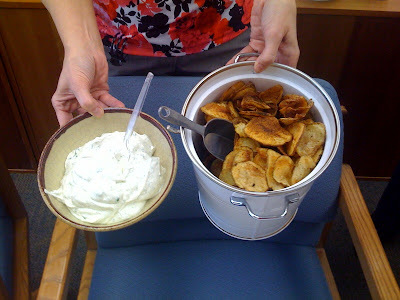 One girl brought the BEST homemade chips and dip I have ever eaten in my life. Good golly miss molly, they were delcious. And my boss brought my favorite chicken salad in the entire world. Remember when I blogged about it a few weeks ago? 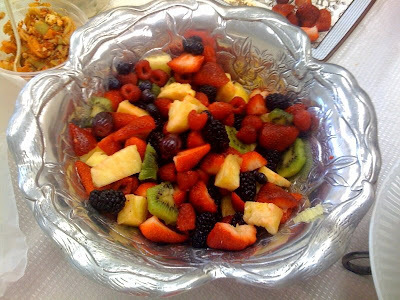 Another one brought this fabulous fruit salad in a beautiful bunny bowl! There were a few other edibles that I didn't get a picture of - like two different salads...they sure were good, though. After gorging on lunch, it was present time. 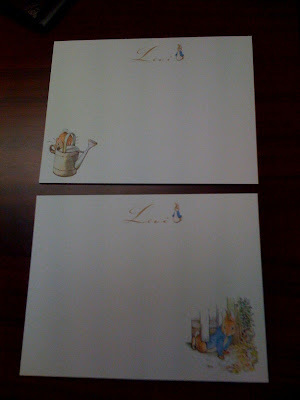 I got several wonderful gifts, but I've GOT to show you the cards Lindsey had made for me! This picture does not do them justice because you can't see them very well, but they have Peter Rabbit on them with Levi's name at the top. How presh! There are also matching envelopes with my address written beautifully on the back, but I can't show you them or you might come murder me. She also made me these SUPER CUTE "Mom Cards", but I can't figure out how to show you without you knowing my last name and phone number. Again, you might come murder me. But take my word, they are adorable. HAHA! I was so excited because this was the last thing I needed!! I registered for it, but doubted anyone would get it for me because a.) it's expensive and b.) it's a BREAST PUMP. We work with only one guy, and while he was slightly humiliated, I was super excited. It's funny though because I had opened some nursing pads a few moments before but didn't take them out of the sack "for Pat's sake". Little did I know, I was going to get the whole pump and he helped pay for it! HA! Anyway, I was so grateful for such a nice gift. I definitely wasn't expecting it and planned on buying it myself. Now I am all set to have this little boy!! Horray! Awesome. Looks like did a great job...And you finally got your pump! You are definatley set. Tell Levi he can come out and play now! Whitney, FYI - those nursery rhyme plates are at Hobby Lobby and have matching napkins. We used the napkins to decoupage eggs and I'm sad I didn't get a better picture of mine, but it was ADORABLE. The cutest thing ever. And the napkins worked PERFECTLY! You can kind of see it in the last picture on my Egg Night post. How sweet! I LOVE those plates! Adorable. And how awesome about the pump! Levi, your momma is ready!!! Too cute! Where do people get all those neat things? Amber (my SIL) would especially love those plates. She is a huge fan of toile! Yay, for baby luncheons! I had so much fun doing everything. I'm so glad you had a good time. Did you watch the DVD last night that came with the pump!?! haha! Congrats!! What a great gift! 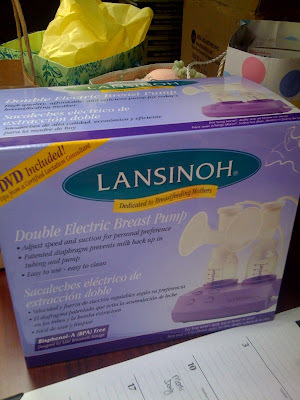 Yay for the breast pump! A little word of advice (I know, I know, advice is annoying, but my friend gave me this advice and I didn't follow it and then regretted it), go ahead and boil the plastic parts as the instructions say BEFORE Levi comes. I didn't do it because I figured I wouldn't need the pump for a while ... and I had to end up pumping from the first day I got home. Trust me, better to do the boiling and preparing before your "pectoral region" is hugely engorged and you have a newborn!! Better safe than sorry and I so wish I had done that! Super-cute plates, by the way!! Sounds like a fun luncheon!!! And Yay for getting the pump!!! As personal as it may be, there is nothing better than a good pump! I will be visiting Hobby Lobby to snag some of those plates! Too Cute! what a great shower! so beautiful. and now i'm starving after looking at all that food! What a sweet office! And those cards are beautiful! And that toile plate???? OH MY GOODNESS! I totally wanted to do the baby nursery in toile, but my husband drew the line. He said when we have a girl, then MAYBE.... Party pooper. YAY! We're so close, Whitney!!! OHHH HOW PRESH!! (lol) I love those big things hanging from the ceiling, lindsey will JUST have to show us how to make them!! I left you a suprise over at my blog! stop in and check it out! What a great little party! They must really care for you. Wow, homemade chips!! What a fabulous baby luncheon. Everything looked so delish, now I'm hungry. haha! Those cards are so sweet and a very thoughtful gift. Yay, for such great friends and coworkers! i must say, those plates look amazing! i can't wait to get pregnant and think of fun ideas to decorate and such. I think your idea for Levi's room is really original! i love it!thanks for sharing your life! Thats the pump I have and its amaaaaaazing. What sweet people you work alongside. You're all ready now to welcome little Levi! Everything was so cute! They did a GREAT job! You can blur out any information that you don't won't others to see. I've seen several bloggers do it, but I haven't done it myself. Just a thought. Showers are so much fun. I had 5 with my 1st!! Lots of stuff and I felt very loved. Looks like such a great shower! And I agree Lindsey is the next Martha Stewart! soooo cute! And great idea for the breast pump... i need to look at that brand! HI-LAR-EEEEE-US about your male coworker! What a nice shower your co-workers gave you! I'm so glad you (and the baby) are doing fine after your accident. Looks like you've got some great coworkers! I'm the only woman in our office, so I can only imagine them throwing me a shower of any kind! The only thing they throw for me, or should I say at me, are rubber balls and rubber bands!